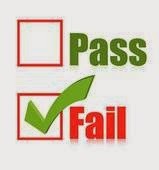 This afternoon I failed. Kind of big time. I'd posted on Google+ and Twitter that I was going stream a Hangout on Air (HOA) as I worked with a group of Kindergarten teachers on setting up classroom blogs. I had the resources prepared, and I had no problems with traffic on my way to the school. I'm passionate about blogging and thing that it is a fantastic way to improve home/school communication. And then things started going wrong. I didn't read my email closely enough. Although I had the event booked for 3:00 pm in my calendar, and that's what I'd advertised, the school didn't even finish until 3:40 pm. That was totally my fault, not the fault of anyone at the school. In spite of that, I started my Hangout at 3:00, just in case anyone was expecting to start then. One brave soul was there (THANK YOU whomever you were and I apologize). Unfortunately, I had no way to directly communicate with them, because I hadn't sent them a direct invite, so I guess they couldn't join the hangout and we couldn't actually interact. I tried to let that person know about my mistake, and that I was hoping to actually start around 3:45 om. I wanted to see if I could restart the video for my HOA, because I thought that at least people wouldn't need to watch 20 min of me getting my act together, so I tried stopping and starting it. Apparently there is no way to restart it. So, I needed to set up a new HOA. I did that and left the link to the new HOA in the old event. Eventually the teachers arrived, but some had to change plans, and it ended up that the teachers I was working with had already started blogs and seen my presentation on why blogging is awesome before. So, to be fair to them, I just jumped ahead into blog set up. They'd already done most of it, but I didn't want to totally neglect my attempt to do a Hangout on Air, and I figured I could clean it up again. Again, I apologized to the TWO viewers who were watching the hangout and I will record that screencast that takes you through my presentation on why I think blogging is fantastic in the near future. The teachers I worked with were fantastic as I tried to balance getting information out via YouTube and addressing their needs in the classroom and I really appreciate that people gave up their time to try and take part in this professional learning. The last element of failure, was that I tried to go into YouTube editor to clean up the HOA video, and I don't think I can! It's not even showing up in my playlist. So I'm stuck with this disastrous 1.5 hour video, and I can't even erase the parts that show me just waiting to get started (if you want to torture yourself, you can watch it here - it should start midway through where I actually start taking people through the blog set up). I'm hoping it shows up soon in my list of videos that I can edit. So, would I do this again? Probably. I think that there is value in attempting to share professional learning opportunities in real time, and archiving them on YouTube can help the people who were there and want to revisit the work or let visual learners access the learning in a way that fits their learning style better. I think that the single most important change I will make is to actually make sure that I have some real people in the hangout at remote locations, so that I can get effective feedback, in real time. Thanks again to the teachers and viewers who gave up their time. I hope that I can do a better job next time. Online Calendars: Am I just doing it for them? What prompted her question was my suggestion that she actually do most of the work to populate the calendar and add her students as viewers. For years, I’ve heard the argument that using an agenda teaches students better self-regulation skills, and I think there may be some value to that, for some students. However, in my experience, “agenda time” meant that all students copied the exact same thing off the board and I walked around the class to verify they had done so. The reaction of many of my students (at various grade levels), was something like, “[Groan], I don’t even use this. Why do I have to do it?” and I tended to agree with them. I’m pretty sure that students get enough practice in copying things down in school. That’s why I switched to a classroom blog several years ago and stopped requiring all students to use a paper agenda. They were free to use one if they chose to, but I wasn’t going waste their time, or mine, on copying from the board. My rationale for creating the calendar and populating it (and this applies to blogs and many other online tools teachers may use as well), is that we want to teach students to appreciate the value in an organizer, and how to use it as a valuable reference tool. With a paper agenda, I might have students copy “Math Test on Friday” off of the board, but if I use an electronic calendar, I can actually link to activities and resources that will help them study. 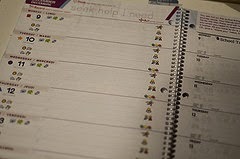 A paper agenda can be misplaced at home or at school. A online calendar can’t be lost, and because I can add parents as viewers of the calendar, I no longer need to check agendas each day. I think that if students come to see their electronic calendars (classroom blogs/sites/organizers/etc.) as resources that provide valuable information to them (through the use of links and attachments), and are accessible in a variety of formats (e.g. on mobile devices, the web, or even in a variety of printed formats), they will begin to consider the use of these tools independently and in a format that works best for them. If a teacher models the use of the Calendar and points out the resources that are included, students have a reason to use these tools outside of the classroom. Then students will have actually learned something beyond how to copy. For more on how you might use Google Calendar in your classroom click here to see Google for Education's official resources.